Dimensions: 8 1/2" x 9 1/2"
This great new book makes the wonderful diversity of American carriages availabl in countless outstanding and detailed Victorian engravings, each with a detailed description. It features 168 illustrations of carriages - most from the period of 1850 to 1900: chaises, dog carts, hansome cabs, sulkies, road carts, piano-box buggies, surreys...the list goes on and on. 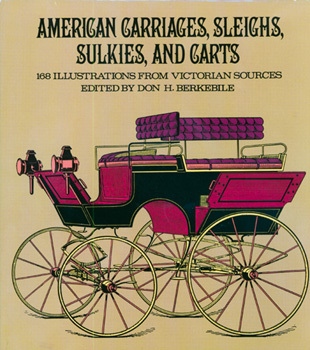 Accompanying the high-quality engravings is an informative introduction to American carriages detailing their development and place in American life. This book will have a wide variety of uses to carriage restorers, model builders, transportation buffs, and those who enjoy seeing the important elements that made up American life.